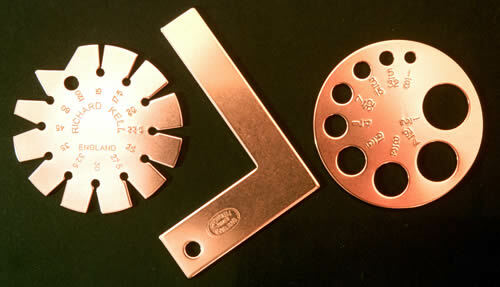 The original Richard Kell Bevel Gauge, in continuous production for many years now. Beware of an imitation going the rounds, it has not got my name on it nor has it got my quality. I pay great attention to all points of detail, my deburring is second to none, once handled its obvious the quality. Twelve accurate angle cut outs with apex cut-away to prevent damage to prepared cutting edges. Overall 2 inches diameter. See my youtube channel on how to use it correctly. Bevel Gauge £9.49 ex vat. 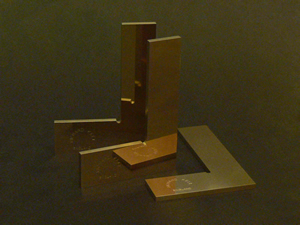 A deceptively simple plate square produced to within Â½ thou inch square along any edge, a tolerance tighter than British standard engineers grade B. Overall 2Â½in. Plate Square price £7.42 ex vat. 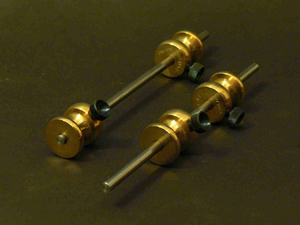 Drill and dowel gauge with a range of 1/8 to 1/2 inch dia. Again, surprisingly accurate, hole diameter to B.S. engineers 'h6' reamer tolerance. Overall 2 inches diameter. Sorry to say my drill and dowel gauge is now discontinued. Workers have asked me for this for a long time, a super accurate tool that I reckon is within one thou inch max deviation along any edge and in fact probably better. Dimensions 3 inch inch long leg, 2-1/4 short leg. A nice tool to handle, to have on the workbench, heavy too. 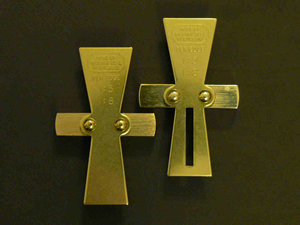 Carefully machined with super crisp flat edges from notoriously flat 3mm engravers 'compo' brass sheet. Once seen it really does sell itself ! Standard dovetail mark without slot, deluxe version with slot to act as try square to aid marking out. Slope per edge 1:5 for softwoods, 1:8 for hardwoods. Solid brass 2-1/2 inches overall. Superb quality. 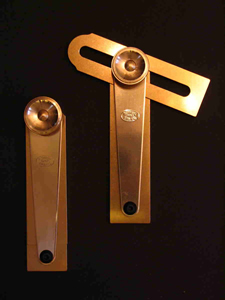 As with all my tools made from solid brass and finished to a very high standard my centre finder is to 8-3/4 in dia. capacity, overall tool 5-1/4 inches. This is the only device capable of marking off a line at right angles to a curved edge, i.e. 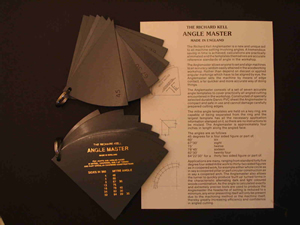 The Richard Kell Angle Master is a unique set of seven very accurate angle templates including 45Â°, eliminating any calculations to set a machine 'spot-on'. Produced to one thou inch tolerance along any four inch edge, tooling produced using toolmakers sine bar and inspection grade slip gauges. The cuts per 360Â° circle are 4,6,8,12,24, and 32. Hint: play around with scissors, paper and these angle templates and you will not be able to hold back from cutting and amount of different mitres. Sorry, my Angle Master is no longer available. 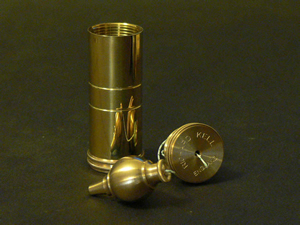 Beautifully designed and made, flawless quality, solid brass. Hand turned detail. Four Inches overall. 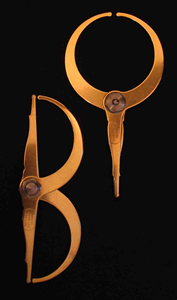 The Richard Kell double ended caliper is five inches overall, incorporating a unique high quality centre joint, comprising p.t.f.e. washer, fitted bronze bush and close tolerance steel hub. The same caliper functions in two modes, internal to external and by rotating 180Â° is a very sensitive and precise wall thickness caliper. I made the prototype forty years ago for my own adventures in turning small work. Sorry my double ended caliper is no longer available. I'm re-introducing this after nearly a quarter century being unavailable. I was the first to offer this commercially. Certainly hand crafted, very carefully made, illustrating the trade of 'brass finisher' a line of work long extinct. Interestingly the handtool that I use to form the outer bobbin concave flange is stamped H & D ie Holtzapffel and Deyerlein a partnership that ceased around the same time that Stephensons 'Rocket' first ran at the Rainhill Trials. Two well fitting sliding brass bobbins to 'remember' whatever dimension, actually a handy device in my own place for 'centring' all my die-cut packaging; spawned wheel marking gauges to follow. Heat blued nicely turned steel locking screws onto 3/16 dia stainless rod 5-3/4 inch (ie 146mm) overall. 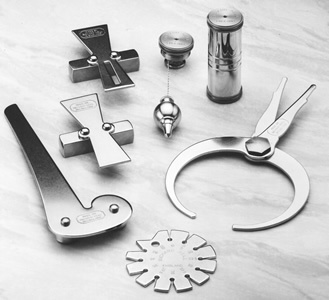 I first offered this in the mid/late 1980's and as with the plumb bob was one of those items discontinued because of being busy with tooling for electronic circuit board assembly, with hindsight I should have kept these items in production, other firms picked up the ideas and called them their own!